Last week, newly-elected Toronto Mayor Rob Ford continued his campaign rhetoric by proclaiming that “the war on the car is over.” On the first day of his mayoralty, Ford announced he intends to halt construction of a light rail transit line on Sheppard Avenue. The mayor says a subway under Sheppard Avenue should be built instead of the surface light rail line running in its own right of way on the suburban thoroughfare. Placing transit along Sheppard Avenue underground, with its massive cost increases and unsure future, falls in line with Ford’s conception of streets as primarily conduits for car and truck traffic. If the “war on the car” in Toronto is apparently now over, when exactly did it begin? Defining restrictions on car use and measures to improve other forms of mobility as a “war” obviously contains an explicit value judgment at the root of its military metaphor: drivers on the defensive against those fighting a campaign against the automobile. Conflicting understandings of the car’s place in urban environments, however, date back to the turn of the twentieth century, when the horseless carriage first arrived on city streets. Many Ford supporters would probably suggest that Toronto’s previous mayor, David Miller, represented if not the beginning than at least the apex of the war on the car. Miller was a champion of bike lanes on streets and pedestrian-friendly policies. Miller’s second term also saw City Hall pass a $60 vehicle registration tax, which all major candidates during the recent mayoral election – including Miller’s deputy mayor and long time councillor Joe Pantalone – stated they would repeal. Miller was the most public spokesperson for Transit City, and its social vision of serving “priority neighbourhoods” with accessible and convenient transit. Others might trace the war on the car in Canada’s largest city to 1971, when Ontario Premier Bill Davis cancelled the completion of the Spadina Expressway (known today as Allen Road). Drawing on rising environmental concerns and protest from residents who believed the expressway threatened inner-city neighbourhoods, Davis famously declared: “If we are building a transportation system to serve the automobile, the Spadina Expressway would be a good place to start. But if we are building a transportation system to serve people, the Spadina Expressway is a good place to stop.” The premier announced that the province now planned to increase investment in transit, although his government continued to build highways and allow auto-dependent development outside the city and within the Toronto commuter-shed. Yet negative impressions of the impacts of cars on cities – and restrictions on their use – have existed since the introduction of the new technology, not only in Toronto, but also across North America. Stephen Davies, for example, writes that the automobile promised freedom of mobility, yet it escalated urban traffic congestion. Automobility also demanded restrictions on its users through driver’s licenses, speed limits, and other government regulations. During the 1910s, Toronto’s city council decided that police could summon drivers who parked cars on streets other than those designated for parking purposes. Conflict between pedestrians and automobile users occurred as soon as cars began to drive on city streets. At its worst, automobiles threatened the lives of pedestrians, especially children. The Premier of Ontario, in 1910, remarked that the pedestrian “has the first right of the road. The chauffeur who thinks that . . . he is entitled to the road, is utterly and entirely wrong. He comes after the pedestrian and even after the man on the bicycle.” The growth in car ownership by the 1920s, however, redefined the priority of respective urban travel forms. Pedestrians became “jaywalkers”, a process US historian Peter Norton has also examined in his Fighting Traffic: The Dawn of the Motor Age in the American City (2008). A good (short) review about “the war on the car” or anti-automobilism, which left us wanting more informations about the past and how it may help to understand the present. However, if there has been some critics at the beginning of the twentieth century in several cities about the motor car, we have to put them in perspective. At the beginning of the automobile age, the motor car has been mainly accepted; the contestations came from few urban people (a little less than in rural areas). The critics about automobilism in cities (but not only in these areas) have occured since 30-40 years ago and focused mainly on environmental problems, congestion and the question of competition with public transportation. Thank you for reading the post, Etienne. I certainly agree that perceptions of automobility have changed over the past century within the changing contexts of wider society, particularly in terms of our relationship with and faith in technology. I think it is important for us to remember that many people did not automatically accept the automobile with its introduction at the beginning of the twentieth century. Measuring this statement, of course, is a challenging task. The increasing number of automobile owners during the first half of the century (interspersed by events such as the Depression and Second World War) certainly illustrates an acceptance of the automobile. However, I hope my post showed that this acceptance was also matched by an early realization of the negative sides of automobility. Peter Norton’s discussion of monuments built in US cities the 1920s to commemorate children killed by automobiles is a fascinating example of this. 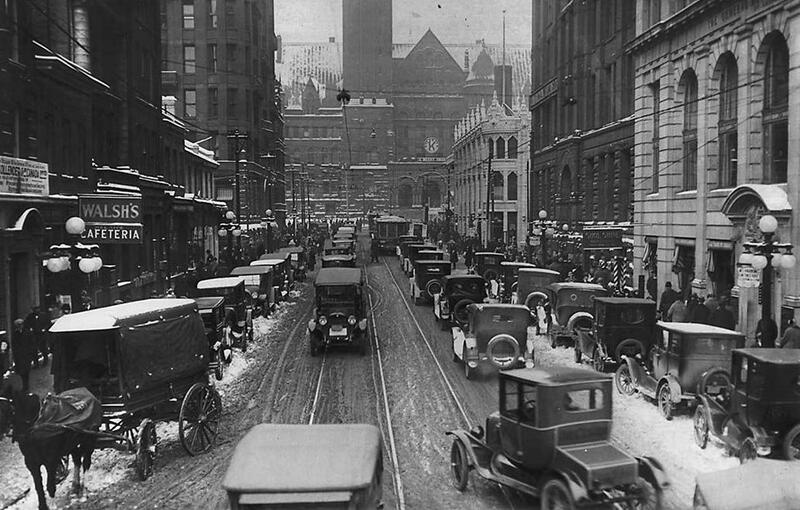 Issues of congestion and competition with public transit were also prominent since the early days of the automobile. The restriction of car parking in Toronto showed an awareness that cars blocked main thoroughfares, although by the 1920s the solution across North American often meant street widening or constructing new streets. Toronto’s transit agency (the Toronto Transportation Commission) also critiqued the ways in which cars impeded the movement and efficiency of their transit vehicles during the 1920s. I assume – although I have no evidence of this – that many of their thousands of passengers would have concurred. Nonetheless, I agree that over the past 30-40 years the rise of the modern environmental movement, the 1970s oil crisis, the impact of postwar automobile infrastructure (large-scale expressway building through urban areas, for example) on urban communities – to name a few factors – changed the tenor of anti-automobilism.